Hey everyone! Roree here with today's Thursday Sketch Challenge. I started with a square layout and kept it fairly simple to leave it more open to interpretation. I stayed pretty true to the sketch and used lots of Daily Flash products, primarily the Snapshots and Girl Talk mini collections. I used patterned paper, Snap Caps, and stitching to replace the strips in the sketch and layered the Partly Cloudy chipboard clouds and a patterned paper sun in place of the photo squares in the sketch. For the sentiment, I searched way back in my stash and found some great letter stickers from the Campfire collection, Dandelions "Story Book" alphas, and a puffy heart from from Apple Cider Pop Drops. I hope you enjoyed today's sketch and the samples Mel and I created using it. If you get a chance to play along, don't forget to post your project in the OA Flickr group. We can't wait to see how you interpret it. Hey everyone! Roree here, and I have a Tuesday tutorial for you. so I thought I would share with you how I made them. I then sanded the edges of my flowers (totally optional), and curled the ends of each petal. I added foam adhesive to the center of each flower except the top one. I then layered and adhered the flowers together from smallest to largest. I pierced holes at the center of the flower, using the button that I wanted for the center as a guide. I hand stitched the button onto the flower, and I finished by fluffing the petals back up. And voila! My finished flower! Pretty easy, right?! I made a couple more, along with some mini ones, cut out a few leaves, and created this card full of flowers. I added cross stitches to the center of the mini flowers instead of trying to find a bunch of tiny buttons. I hope you enjoyed today's tutorial. If you get a chance to make some flowers of your own, make sure to share them with us in the OA Flickr Gallery. We would love to see your creations! Hi there! Mandie here for my first guest post. I am so excited to be here this month! (& a little nervous too! lol!) I've made a couple of layouts to share with you all this week. The first one uses several lines from my stash. If you are like me, you have a TON of lovely October Afternoon product lurking in your stash. Waiting to be used, but you just love it so much you haven't cut into it! I used product from Schoolhouse, Report Card, Holiday Style, Campfire, Sidewalks & a smidge of Farmhouse. I love how all of the lines coordinated nicely with one another. Bust those papers out and use them! My second layout uses Sasparilla (oh my heart, this line is ADORABLE! can't wait to use it some more!) and a bit of Farmhouse. Again, the patterns in these 2 lines mix so well! I encourage you to mix them up a bit! They yellows, blues and greys just mesh together so well! I am totally loving the blues and greys in Sasparilla! They are such a pretty shade! That concludes my post for this week! Until next time... Have a great weekend! Hi everyone, Roree here, and today I have a sketch challenge for you! I decided to go with an 8.5 x 11” format. I kept the design simple with the opportunity to use multiple photos. But for me, a square or rectangular box on a sketch doesn’t always read as a photo. I love to fill them with fun embellishments. And that is what I did. I created the sketch before I created the layout, so I had to make some adjustments to it to make it work with the photos that I decided to use. I went with two horizontal photos instead of the one that is shown in the sketch. To make up for the extra space I had to use, the border around the whole layout had to be changed up and just used along the top and bottom of the layout. I did stay pretty close to the actual layout placement, but I used one of the boxes for a little scene rather than a third photo. For the journaling and scene, I created stitched boxes (machine and hand stitched) and place some Chip ‘n Stick chipboard pieces around the edges. The Sidewalks products were so fun to work with. Such beautiful colors and sweet images… Everything about this collection just makes me happy! Amy played along with my sketch this week, and she had such a wonderful take on it. I just LOVE Amy’s layout, don’t you?! I hope you all get a chance to play along with the sketch. If you do, please post it to the OA Flicker Gallery, so we can all see your take on it. And who knows, uploading to the gallery may just get you featured on the OA blog. This Sunday is Father's Day...what are you giving to the special dad in your life? The design team has been busy whipping up some fun card ideas that we are excited to share. Masculine designs can be challenging, but don't worry, OA has plenty of fun products to make them an easy task! First, we have a card by Lexi Bridges "I Heart My Dad". Lexi says "This one is simple and little kid-ish :) The Campfire line can definitely have a "manly" vibe so combine it with the bear from Rocket Age and the fun quote and it makes the perfect card to come from a kiddo. I also used the Comet Tail sprinkler against the blue background to make it pop." 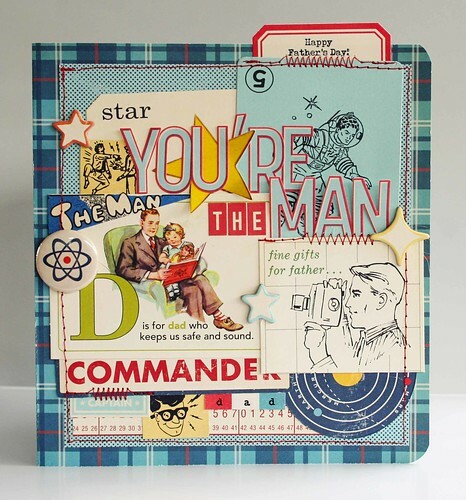 Jill says "Every father deserves a "man card" for Father's Day, am I right? I brought together some manly-man odds and ends from the Rocket Age line as well as some Thrift Shop and Report Card wild cards." "You're Out of This World" card by Marcy Penner. Marcy embossed the little robot onto a tag. Then she unscrewed the Tin Type sprinkler bottle, dipped her paintbrush in and painted the robot. What a cool way to use the sprinklers! 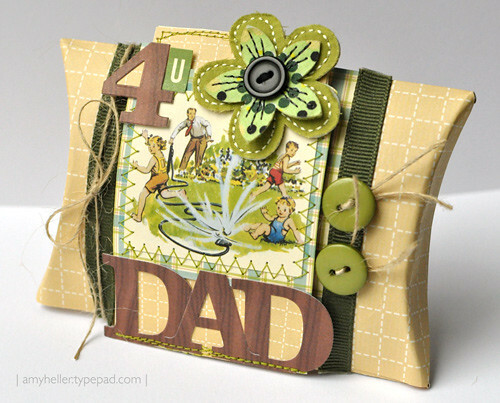 "I Love You Dad" card by Roree Rumph. 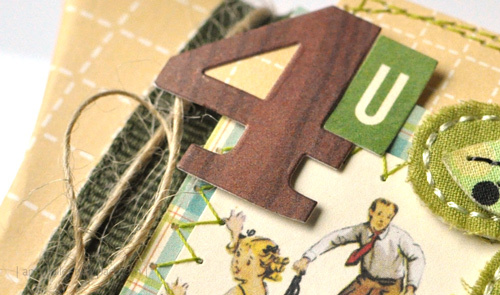 She used 5 and Dime, Thrift Shop and Report Card to put this adorable card together. Amy Heller's Father's Day Pillow Box "4 U Dad"
Amy created the main image with the B side of paper from Report Card. She used Campfire for the other papers and alpha letters. The buttons are from Schoolhouse, too. Don't you love how Kinsey used the sticker background from the mini-markets to create a mask? This card is full of cool techniques you gotta try!